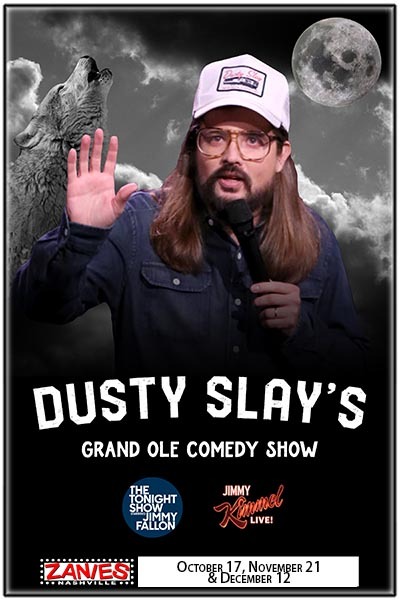 Dusty Slay’s Grand Ole Comedy Show is a showcase of Nashville’s best homegrown comedy talent. Stand-up, storytellers and musical comedy, you never know what you’re going to get when you walk through the legendary Zanies doors, but you know it’s going to be fantastic. Nashville is known as Music City, but one of its best kept secrets is its thriving comedy scene that has kept it’s self hidden…until now! Rising star comedian and local favorite, Dusty Slay has teamed up with Zanies Comedy Club to bring a night of fun filled live entertainment for the price of a movie ticket. About Dusty Slay: Dusty has a smooth southern style that will make you feel so comfortable you have to laugh. It’s like cornbread telling you jokes. He’s clever, quick witted and relatable. Slay was born in Alabama, splitting his time living in a trailer park and on a farm. One would say he was born to be a comedian…or a meth addict. In 2004 Slay moved to Charleston, South Carolina where he began performing Improv Comedy which led to stand up and he is now performing all over the country. Slay recently relocated to Nashville, TN. Dusty was recently featured on Laughs on Fox and has appeared on Jimmy Kimmel Live!, “The Bob and Tom Show”, Last Comic Standing, Laughing Skull Festival of 2015, Charleston Comedy Festival 2012-2015, and Cape Fear Comedy Festival 2012. Slay was in invited to the Just For Laughs Festival in Montreal as part of the 2018 New Faces and has appeared on several network shows including The Tonight Show with Jimmy Fallon, ABC's Jimmy Kimmel Live, NBC’s "Last Comic Standing", the popular program "Laughs on FOX" and he was a featured comedian on "TMZ". Dusty's comedy is regularly showcased on many nationally syndicated radio programs including Sirius XM, Pandora Radio and "The Bob and Tom Radio Show".